Bought this fish from Giant (Vivocity). Seabass, 2 for $8.40. Very delicious! Compared to fried fish in western countries, Chinese people always choose to cook fish in different ways, like fish soup, braised fish in brown sauce, or steamed fish. 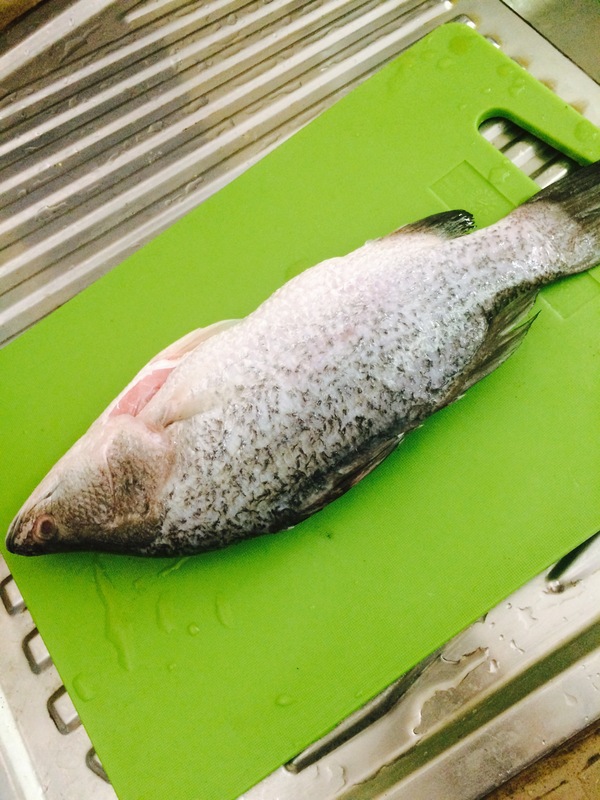 I bought this sea bass from supermarket. Yet, I found it too big and we didn’t have a pan big enough to cook it. So I decided to divided it into two parts. Fish head for the soup. Fish body and tail for the braised one. Fish head soup is very popular in China, since many people think this dish is very good for health. Nutritious elements in fish will be contained in the soup. It is not difficult to make fish soup. 1. Heat the oil in the pan, and fry two sides of the fish head. When the color turns a little brown, pour in the hot water.